Chianti Classico DOCG & Toscana Rosso IGT from Azienda Agricola Montesecondo. Silvio Messana. Photo by Alex Finberg. In a previous life, Silvio & Catalina Messana were New Yorkers. There had always been this beautiful farm in Tuscany outside of Florence where Silvio’s mother lived. They visited yearly. His father had planted vineyards there in the early 70’s. Since his death, his mother looked after them and sold the grapes to a local negociant. In the mid-90’s, Silvio’s mother was ill and Silvio’s family decided to move back to be near her. By this time, Silvio already had developed a passion for wine in the United States. With the certain impossibility of finding an affordable rent in New York and 3 growing sons, Silvio & Catalina decided to stay on after his mother’s death, turning the Chianti Classico farm into their home with a portion of the farm converted as a half-year bed-and-breakfast. Silvio immediately began working on the vineyards himself. The first vintage that Silvio estate-bottled was the 2000. There was a lot to learn and unlearn. He made friendships with only a few of the suspicious neighboring Tuscan vignaoli, but Paolo di Marchi of Isole e Olena, himself a foreigner (he's from Piemonte) and his former agronomist Paolo Masi, were encouraging and helpful with practical matters. Catalina was against using any chemicals on the farm, insisting there must be a better way. 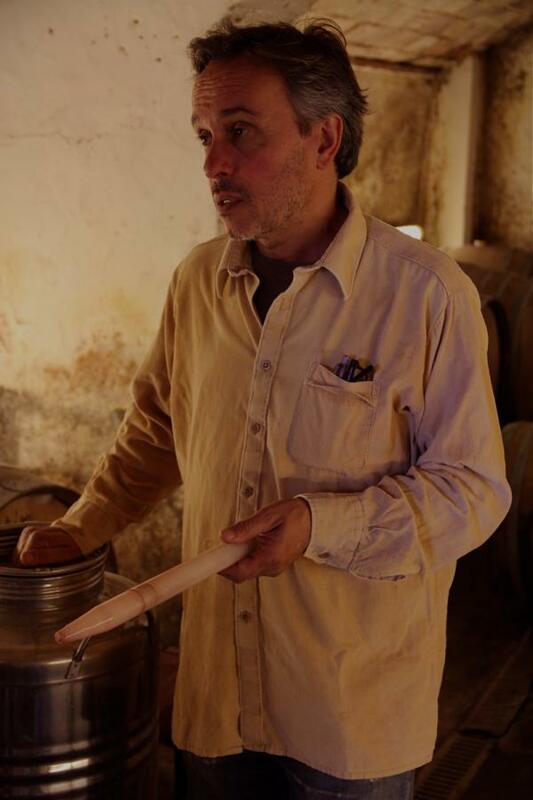 Gradually through introductions to winemakers outside of the region who were using biodynamic vineyard practices (among them Nicolas Joly, Stefano Bellotti of Cascina degli Ulivi and, inidrectly, Sandro Sangiorgio, the director of the wine magazine Porthos), Silvio began to lose his fears and have faith that it was possible. 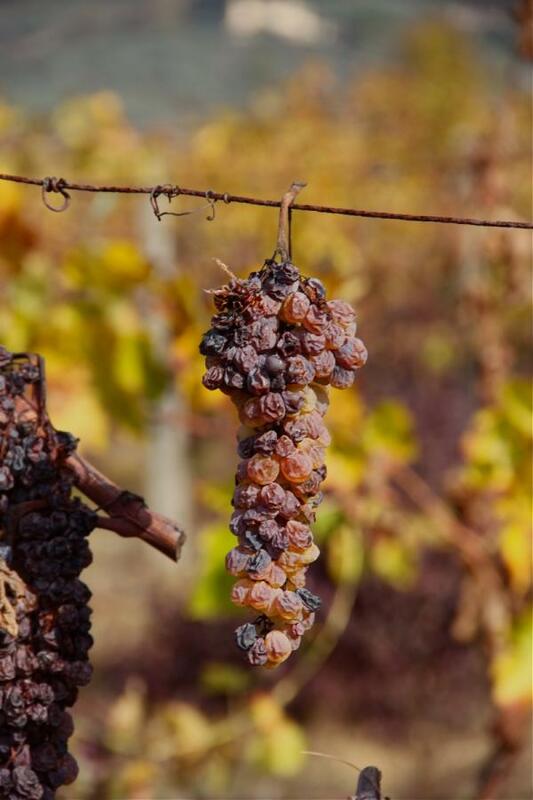 Their advice led the Messanas to take the leap into natural farming and seeking a way to make the wine without the use of added yeasts or other additives and enhancers. In the meantime, piece by piece, Silvio built a winemaking facility with his own hands (there was a small winemaking “garage” on the estate before) and things fell into place. In the spring of 2004 while visiting Montesecondo, we tasted a vat of 2003 Sangiovese and Canaiolo that was still in tank (no wood). It was juicy, bright and delicious and, in every respect, it showed itself a Chianti. I mentioned that it would be delicious bottled like this; Silvio agreed, but shook his head. It would be complicated. Then a little later at lunch, I popped a Ruché from our producer in Colli Astigiani that was bottled briefly following a time in large, very neutral barrels (basically a tank wine). It was charming and incredibly drinkable, not simple, but not overly complex. Silvio was inspired by its unpretentiousness. I left their house that day, and Silvio was deeply considering the idea of doing a tank bottling of Chianti. In the fall, Silvio told me that it was bottled. He also said it did not pass for DOCG status first for too much color and on the second submission for lack of color. Paolo di Marchi at Isole e Olena had submitted his Chianti Classico bottling twice and had been denied the DOCG for the same reason. Paolo de Marchi submitted a third time and his wine passed; Silvio decided to forgo the third attempt and bottle the wine as Toscano Rosso IGT. (It's allowed to declassify Chianti Classico to Chianti, but this decision must be made by the end of November following the harvest. Past this deadline Chianti Classico can only be declassified to IGT Rosso.) On a more consistant note, his submitted bottles for Chianti Classico, with samples from oak barrels, have never had any problem receiving the DOCG. The curious thing here is that now all sorts of nontraditional Chianti grapes – including Merlot, Cabernet and other non-indigenous types – and barrique treatments are allowed for DOCG Chianti Classico. At the same time a wine made just using Sangiovese and Canaiolo grapes grown in Chianti Classico soils and vinified in the method of older chianti traditions (tank or large Slavonian oak barrels) are deemed "atypical" and are being denied the right to use the Chianti or Chianti Classico name. This is the state of the bureaucracy’s influence on the denominazioni of Italy (it's an even bigger problem in some appellations of France) and how the idea of the DOCG's identity, its "typicity", is being reshaped to a new market-based ideal that has no bearing on the traditions of the region. To watch a winery and winemaker grow and find their path, the way that Montesecondo and Silvio (with Catalina) have done so well, in a world that holds many differing views of what wine should be and how it should taste, has been one of the great pleasures of our career as importers. This interview with Silvio Messana took place in Los Angeles in March 2011. Montesecondo is a farm my father purchased in 1963. At the time we lived in Tunisia, as both my grandfather and my father had vineyards and olive groves there near Lybia. They had some money to invest and at the time it was very inexpensive to buy land in Tuscany. In fact, if there was a house on the land it was even cheaper because nobody wanted one. Back then there was no "agriturismo" as there is now with tourists renting houses in the area. Most Chianti was being made by bigger producers who'd buy grapes from smaller growers. There was therefore no benefit and little initiative in starting your own small winery. Of course there were some exceptions. Moving along, my father got the land at a very good price and started planting vines. He started with 15 hectares. At the same time, Gadafi came along and took all our properties near Lybia. This left my father starting from scratch; he wasn't broke but there was no money to invest and his hopes of opening a winery never worked out. The vineyards had been planted though, so he joined a cooperative where he sold his grapes to a company that bottled everything. This is how I found the farm. My father died when I was 22 and this was in 1978. I was studying at a university in Florence at the time, and had no choice but to start running the farm. This basically meant keeping things as my father had set them up: growing grapes and selling them to the cooperative. Around 1985 I graduated from university and wanted to move to the States. I got a scholarship in Berkeley and in Boston, and decided to sell the farm. It proved to be a very difficult task. Nobody wanted farms in Tuscany; there was no market for it. Finally, I found a producer who made the down payment and I left that September. A couple of months later I got a call from my family telling me the sale didn't go through. The farm was still ours. I was in the States, and my mother started splitting her time between Tunisia and Italy to manage the farm herself. Because she was living there part time, she restored the house, which up until then was in unlivable conditions. Being a musician, I needed to find a way to make some money so I started selling wine. I worked for a couple of companies in New York and through that I met quite a few people in the wine industry, including some producers. This was key for helping me in what I started doing when I got back to Italy. By now it's the year 2000. I leave the States, move to Tuscany and decide that I will produce and bottle the wine myself. Because of changes in regulation for Chianti Classico at the time, I was only allowed to work 12 of my hectares. So what I did when I first arrived was to replant four hectares. Mostly Sangiovese but I was also advised to plant some Cabernet Sauvignon and Petit Verdot. Back then everybody would blend these two into their Chiantis. Syrah and Merlot were also used to make the wine stronger. The idea was to have a bigger wine that could compete with Bordeaux. This is what Tuscany aspired to. When I started bottling in 2000 I had four tanks and that was it: no winery. I made 3000 bottles that year. I tried to blend the Cabernet and Petit Verdot with the Sangiovese, but I didn't like that so kept those separate. I was only working with those four hectares at the time and stated focusing on how to sell the wine. What's the work like in the vines? It has changed a lot over the years. When I first started I didn't really know what I was doing. I made a lot of calls, went to visit a lot of growers and asked a lot of questions. Through trial and error I got to where I am now. I still have a lot to learn but I now feel I have control of what I'm doing. I started working organically in 2003 and switched to biodynamic viticulture in 2004. The first years I wad too concerned about losing the crop and not being able to produce quality grapes. It took me a while to understand this was an unrealistic fear but at the time I was doing absolutely all the farming and the winemaking: the vineyard work, the tractor, spraying, pruning… I even built part of the winery myself! Coming from a completely different background, my only point of reference was my father, who had previously managed the farm by growing the grapes and selling them to the cooperative. Instead of following this model, I felt it would be a good experience to go into every aspect of grape growing and wine making. It was a lot of work but also a lot of fun. When you find out just how much effort this takes you can't help but learn some humility. It gave everything a greater value. What make you choose to work organically and then biodynamically? Working biodynamically is a learning process that I improve on every year. One thing's for sure: the vineyards have changed and the wines have changed. The Steiner philosophy has been in our family for years now: all of the children went to the Steiner school. The framework of biodynamic farming come from Steiner's philosophy, so in that sense the seed was already there. My first year in the vineyards I used chemical products and working with them was taxing. I could feel them affecting my body. I needed to find a solution but I felt that organic was too much of a compromise, so in 2003 I went to a seminar featuring Nicolas Joly (editor's note: Nicolas is a vigneron who makes great wines in Savennières. He continues to be a seminal voice in biodynamic viticulture, and has written this book on the subject). I was familiar with the type of wine he was making, and thought they were interesting and unique. I was ready to make a change, but more importantly I needed a change. The seminar was in Bologna; I came home the next day, threw out all my chemicals and started working biodynamically. You mention a change in the wines. Can you elaborate on that a little bit? I'm in an area where long maturation and maceration is what people go for. The philosophy is: if you do more to the wine, it will be more of a wine, it will be a better wine. When I first arrived in Tuscany I tried to make wines in this style. The 2005 vintage was very difficult and I had to rush my harvest and leave about 25% of the grapes in the vineyard. This ended up being a blessing in disguise because it was the first year I realized I could have higher acidities. All these years I'd been harvesting in over ripeness. That was the starting point in a radical change in my wines because since 2005 I've been harvesting differently. Sangiovese tends to lose acidity very quickly and I realize this now. It seems like an obvious statement but it took me a while to realize what a different a few days or a week could make. Working biodynamically has helped too in the quality and maturation of the grapes. I see a much better balance in my vineyard now. Up until 2004 I used to sell part of the harvest in bulk and 2005 also marks the first vintage I bottled every single grape of the vineyard myself. What about in the cellar? For reasons I can't really explain, I progressively stopped using industrial yeasts before I went into organic farming. 2002 was my last vintage using industrial yeasts. We concentrated on the work in the fields rather than the winery and it worked perfectly. I've never had any problems with native fermentations. How do you feel about your DOC, and more precisely where your wines fit in the idea of typicity? I don't thing the DOC of Chianti Classico has necessarily helped the denomination. The story of my Rosso Toscano is quite interesting, because when I first made it in 2003 it was with Sangiovese from Chianti Classico vineyards and the chamber of commerce denied the authorization to bottle twice. The first time it didn't have enough color and the second time that it had too much color, which showed me that either way, they did not want that type of wine. They wanted a more traditional Chianti, which are usually blended with non indigenous grapes and marked by wood. Of course this makes them very tannic and much bigger wines. This was the standard that had been set. For me this is not what Sangiovese should or could be. I think a lot of people, when they try my Chianti for the first time, they say "Oh. That's different." Unfortunately this standardization has made people lose their appreciation of Chianti. When I travel around Italy and do tastings, I can tell that people aren't excited by Chianti anymore. I understand, because they tend to be all the same. They're not territorial anymore, they don't reflect the place where they come from. If you look at what Chianti wholesales for, it has really gone down in the the last year. In fact most of the farms that have made a name for themselves in Chianti are run by non Tuscans. I feel that people have forgotten that Sangiovese is a grape that can stand its own ground, which is a pity. What's your take on the whole "natural wine" debate? Wine should taste like the land it comes from. Wine should identify itself by its terroir. I'm doing my best to create selection massales and make wines unique to the area. People should make an effort to grow territorial grapes, indigenous grapes. But it can also be fun and interesting for a consumer to have a Cabernet from Tuscany, which is why I make one. Why not? Cabernet has actually been in Tuscany for a couple of centuries. As long as you're are producing a wine with strong territorial identity, you're doing the right job, because the wine is going to taste like your land and not like every other wine. For me biodynamic viticulture is a tool, not an end. I'm certified organic and in the process of getting my biodynamic certification as well, but I don't put it on the labels. I do however owe it to my customers -for their integrity and respect- that they have legitimate proof that I work this way. The real problem is that organic and biodynamic certifications are not entering the winery in the right way. You can find organic wine which is from organic grapes but in the winery you can filter it, add tannins, a lot of sulfites... Organic wine is not the same as natural wine. 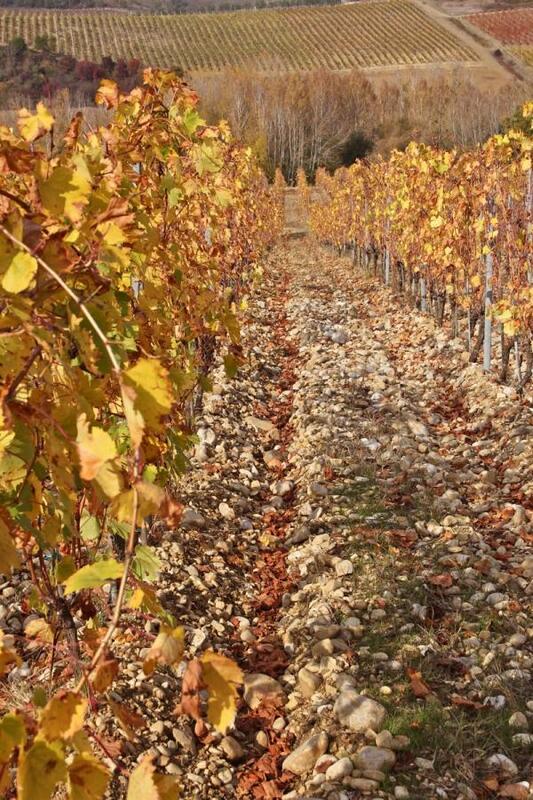 For me biodynamic farming has been a fantastic tool to get a very strong link between the terroir and the wines. This has a lot do with my grapes, but also a lot to do with how I work in the winery. I also try to avoid the term because shouldn't we be be on normal shelves? Aren't our wines just normal? Why qualify ourselves as "natural"? I know we are the minority but for me we are the normal ones. Why talk so much about what we do? We should take more about what everybody else does: additives, preservatives, spraying chemicals. None of this is very natural. Silvo Messana: Terroir vs. Biodynamic/"Natural"
This visit at Montesecondo took place in May, 2013. Words by Jules Dressner, photos by Maya Pedersen. A lot of new, exciting stuff happening at Montesecondo! But before we get into that, here are a bunch of pictures from the vines you can read all about in the 2011 re-cap. Now you get to know what they look like in fall AND spring! Silvio's albarello training is going well. All the albarello re-plantings are in massale. As an experiment, he's also planted two rows in franc de pied, as well as re-grafting a lot of Merlot with Sangiovese. On top of that, Silvio also plans to plant an additional 1.5 hectares of vines on the Montesecondo property. There's some new additions to the Messana family: Fluffy and and Scruffy! Silvio lets them run free and do whatever they want most of the time. The big, exciting news is that Silvio just started renting 6h of Sangiovese vines on very different, non Montesecondo terroirs! At 18km away from the farm, it's about a 30 minute drive. The land is owned by two sisters, and because of the distance, Silvio has hired a full time employee to manage the site. Silvio is currently working the equivalent of 8h on Montesecondo, so 6 extra hectares is quite a boost in work/production. He didn't originally plan taking on so much land, but decided that the opportunity was too good to pass up after visiting the vines. The vines here are between 17 and 30 years old, growing at 450m elevation, which is very high for this part of Tuscany. They are being converted to organics this year, and biodynamic the year after next. Silvio's son Taddeo and Lucy the dog joined us on the visit. For now, he plans to make more IGT Rosso with these grapes, but is open to the idea of bottling a new cuvée once he's familiarized himself with the terroir. Lucy was very satisfied with our walk. Once we'de visited the vineyards, Silvio brought us to one of the owner sisters' nearby property. She was very nice and offered us water and juice. She also loves cats, and has about 20 of them. You know what else she has? Turtles! Next visit: Francesca and Margarita Padovani of Campi di Fonterenza! Twin sister party time! This visit at Montesecondo took place in November, 2011. Words by Jules Dressner, photos by Alex Finberg. 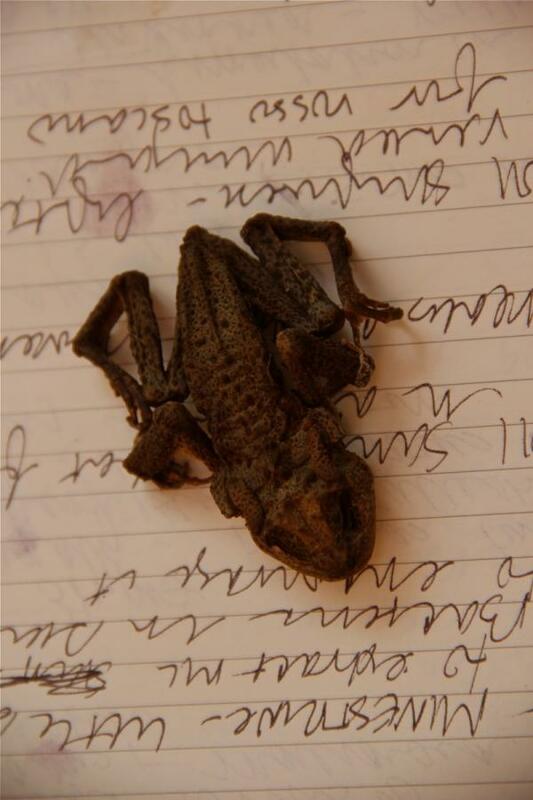 Mere minutes after arriving to Montesecondo, Alex found a dead toad that looks exactly like the estate's logo. We then stepped up to Silvio Messana's cantina. I swear he was more excited to see us than he looks in the picture. 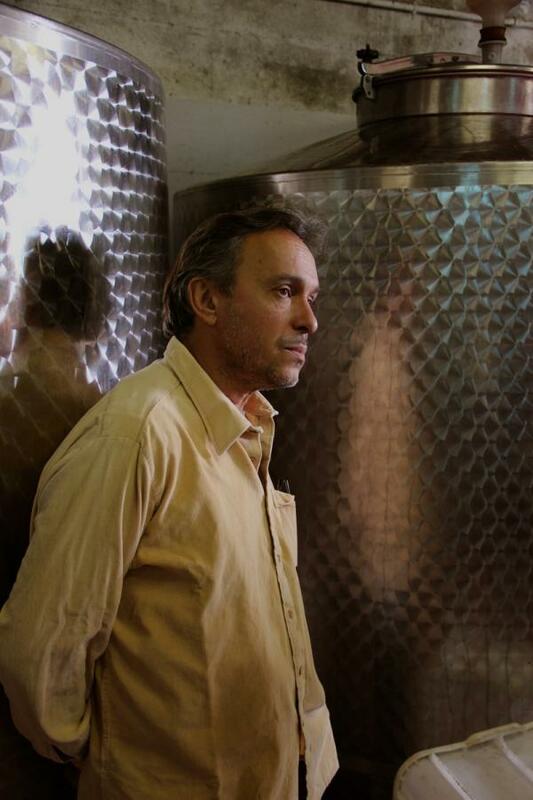 Silvio had a very challenging 2011 harvest but after some initial worries the wine is turning out to be just fine. We tasted a tank sample of the 2011 young vine Sangiovese which spent a lot of time on the lees that had very good acidity and lively fruit. 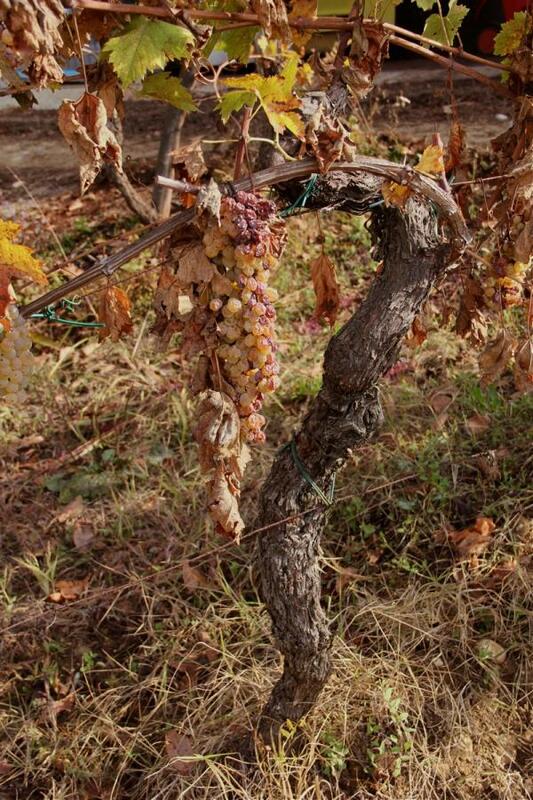 The old vine Sangiovese was darker in color and more concentrated in fruit and minerality. We then tasted some old vine Sangiovese that had been fermented in amphora. 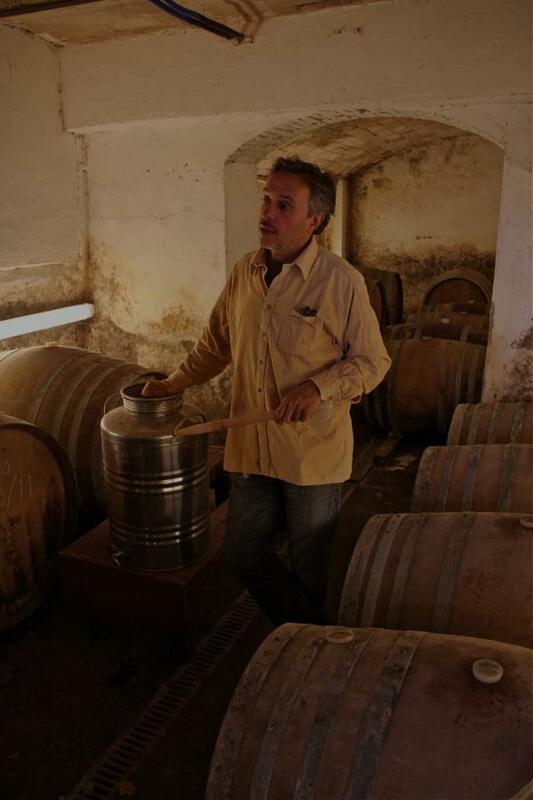 Silvio got his inspiration from tasting Foradori amphora wines, and he uses the same ones as Elisabetta. The juicy quality of the fruit and lighter body of the wine reminded me of Beaujolais. Before heading to the cellar, Silvio offered to let us taste a vat of 100% Colorino yet to be blended into this year's Chianti Classico. Colorino is an indigenous varietal traditionally blended with Sangiovese and Canaiolo to make Chianti; it used to be way more prominent but the D.O.C's aspirations to emulate Bordeaux in the last 30 years have seen it all but disappear, and instead it has been replaced with Cabernet Sauvignon, Merlot and Syrah. 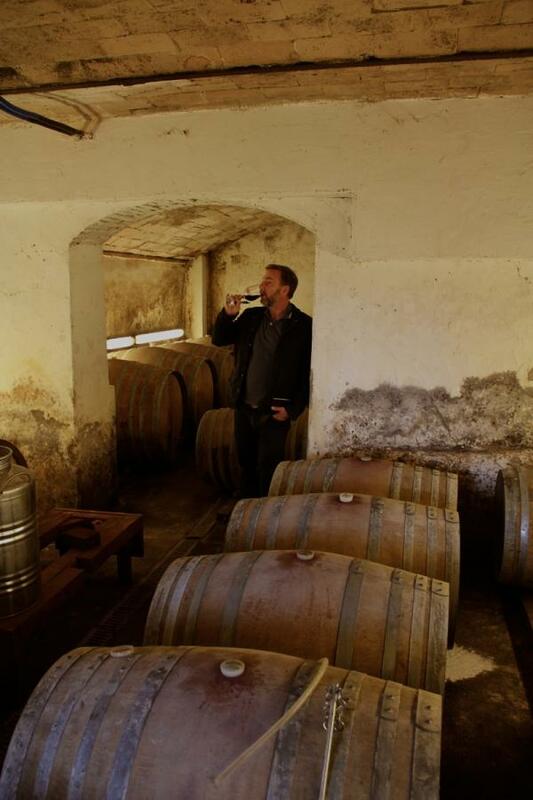 We then made a quick trip to the cellar where Silvio blended a sample from three barrels of what will be the Chianti Classico 2010. Put your orders in early: It's fresh, lively, delicious, and will be bottled in January. Here's Kevin's "Wine Spectator Editorial" pic. It was then time to take a tour of the vines. All of Silvio's vines surround his house, and are composed of three separate and distinct soil types: the vineyards closest to the village are sandy soils, the lower blocks are clay and and the top of the hill is composed of heavy clay and Galestro (heavy alluvial rocks similar to the galets ronds in Chateauneuf). First we checked out some clusters of Trebbiano and Malvasia still hanging out and waiting to be harvested to make Passito. After a tour of the Sangiovese, Canaiolo and Colorino vines, Silvio filled us in on an innovative experiment of his which seemingly will shape the look and style of the vineyard in the future. Guyot is the typical vine-tending system in Chianti, but Silvio feels that he's had a great deal of frustration dealing with an excess in leaves, which he feels smothers the vines. In such - and continuing the pattern of our vignaiolis questioning and changing their vine-tending to better suit their work- Silvio has begun planting and re-grafting many vines in the Albarello (goblet) style. He feels that this way the grapes can hang loose, not be bunched up and benefit from more air. Furthermore, he is planting them on attached poles with each vine quite separated from the next in order to avoid having to use wires in the future but also to give each vine enough space and soil for it excel. As far as he knows, he is the only person doing this in Chianti.